Transform plain curtains into elegant or fun designs. With a few simple embellishments, you can transform your window treatment for a dramatic ambience in a formal dining room or a romantic bedroom design. Sew a braided trim with pearl beads onto the outer edge of the curtain. Gather the curtain in a tieback styles and attach your flower and pearl tieback. Add a silver and white sheer to complete the touch of elegance. A fun look for any curtain is the addition of pompom trim. Select a color that contrasts or matches the curtains. Go dramatic with a complementary color, such as blue and orange, red and green, or yellow and purple. For a child's bedroom or playroom, consider using multi-colored pompoms for a fun, exciting curtain decoration. 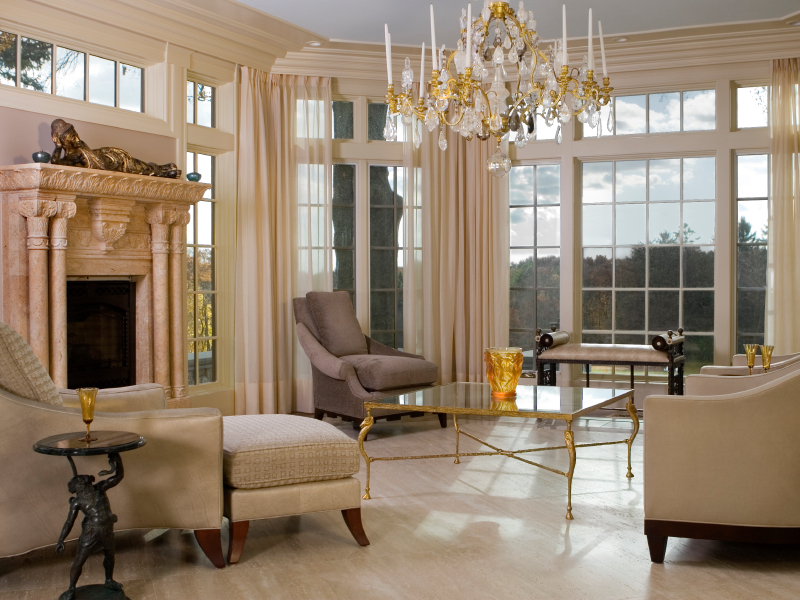 This window treatment features a pair of plain ivory and gold satin curtains. You can recreate this look by using either the same fabric or a contrasting fabric to create satin scrunchie bows for tiebacks. All you need is elastic and satin - just use a larger amount to create bigger scrunchies for curtains than you would for someone's hair. If your curtains aren't quite so formal, you can use this idea to offer depth and contrast to your plain curtains. Consider other fabric choices, such as a plaid for a den, stripe for boy's bedroom, or pattern fabric for a master bedroom. Dress up plain curtains with a striped scarf swag and a solid colored scarf lined with a light colored fabric. This is suitable for a dining room, bedroom, or living room. Add large, twisted, rope cords to mimic the curve of the scarf swag. Measure enough length to fit over the front and back of the swag rod. Secure the ropes with an attractive slip knot. Allow enough rope length to support oversized elegant tassels. Don't forget to add a sheer behind the curtain to complete this great window treatment. Use large clear acrylic beads of different shapes and sizes. String the beads on an elastic cord for easy application. If your decor style is Boho, choose multi-colored beads and have fun making a unique one-of-a-kind tieback design. Transform plain curtain into a special handmade look with an embroidered ribbon. Choose a trim that is wide enough to complement the curtain length. You'll want the color to stand out against the curtain color, so look for something significantly lighter or darker (or complementary) to the curtain. This is a great look for a kitchen window or a bedroom. Set your sewing machine to a cross-stitch top stich for to continue that handmade look. Plain curtains can be transformed for a little girl's bedroom fairyland look and a glam look for a teenager or adult bedroom by adding tulle fabric to the hemline. Measure the width of tulle fabric to determine the bottom width you'll need to cut off the curtains. Use a gather stitch to gather the tulle fabric and create a thick fullness. Sew the tulle to the raw hemline of the cut curtain. Add a fabric rose to the seam line. You can add other types of embellishments, such as braid, crystal, or bead or rope trim. Plain bamboo curtains can be painted to create a geometric, free-style pattern or any design. Choose the pattern you desire and then select the colors you'll need to complete it. Set the curtain on a flat surface, such as a cardboard or tarp. Secure the loose ends of the bamboo canes tying them down with fishing line. Either create a stencil, draw the design directly only to the bamboo curtain, or block off with painters tape. Use spray paint or brush paint onto the bamboo. Be sure to apply lightly to avoid drips. This type of curtain is best suited for an informal décor. It's ideal for a beach or tropical themed schemes. Use this window treatment in a kitchen, den, bedroom, or bathroom. A simple but elegant way to decorate plain curtains is with a fabric tieback embellished with a braid and tassel trim. Many retail curtains come with the same fabric tieback. Either hot glue or sew the trim onto the tieback. Select a trim that will provide contrast and interest; metallic options are excellent for a formal room or if you want a hint of luxury without going all-out. This braid is a combination of light and dark browns. Choose a trim that will go with your room design. This window treatment can be used in any room. This decorating style is an excellent way to add depth and class to a plain curtain. This design is great for a bedroom, dining room or living room. Add a tapestry style trim to the edge of the curtain. Choose a trim that best matches the curtain color along with one or more colors woven into the design. You can either let the curtains fall free or capture in a tieback to show off the new trim. Using a vertical design adds height to a room with low ceilings. This curtain decoration is so easy and provides a splash of whimsical springtime. You can use any type of flower for this design. What makes the floral bouquet in this photo so appealing is the foliage surrounding the hydrangea. Staying in the white color scheme keeps this looking elegant. Create the floral arrangement first, then use an elastic band that attaches to both ends of the flower to secure. Tie on the curtains with floral wire. Add this magical touch to a bedroom for the best look. This design is perfect for any child's bedroom or playroom. The plain white curtains are augmented with two colors of window scarfs that are draped in swags over the curtain in a valance style. You can hot glue plastic decorations to the curtains or you may prefer to make your own embellishments. In fact, you could turn this into an art project with your family. Use colored acetate sheets or other craft material to cut out desired shapes. Choose a theme, such as safari, cowboys, fireman, or fairies. Be sure to use different sizes for greater design interest and depth. One of the best tieback designs is often the simplest. This window treatment uses a different pattern for the tieback, while repeating all the colors in the curtain. The contrast between the design is accented by the different sizes in patterns. If you choose to recreate this, be sure the tieback fabric pattern is at least 2-3 times larger than the curtain pattern. This design choice works for any room. This design uses multiple layers of textures that offer a luxurious, extravagant way to decorate plain curtains. This design will make a richly textured window treatment for a romantic touch in a bedroom or formal dining room. Embellish a pink curtain with a multi-colored scalloped fringe. Add a maroon curtain trimmed with the same style of scalloped fringe. Tie the maroon and pink curtains together with a twisted rope cord tieback. Add a heavy brocade fabric in maroon and browns to introduce a contrasting color that is accented with a tan tassel braided trim. Use a pink twisted rope cord with a jewel-encrusted bell to tieback the brocade curtain. Select a stencil and, using fabric paint, create a new look for plain white curtains. You can use more than one color if you prefer. This can be done for curtains in any room. Keep the stencil pattern in keeping with your overall décor. You may choose to use the pattern only on the top, middle, or bottom portion of the curtain. You may decide to stencil the entire curtain. It's up to you how much of a pattern you create. Once you have your window treatments completed, you may wish to turn your attention to cool ways to paint the doors in your home.